I’ve never eaten a cuban sandwich before, but essentially it is a ham and cheese toasted sandwich with attitude. Opinions vary on the content of a true cuban sandwich. I don’t care if this one is traditional or not. Wow! It has just the right amount of meaty texture and flavour, unctuous cheeses, hot chilli kick, freshness from the parsley(or coriander? ), pickle sourness and crispy, crunchy toasted turkish bread. There are also citrus and garlic hints in there as well. It is the perfect combination of hot, salty, sour and creamy, and it is also very pretty with its green tinge. 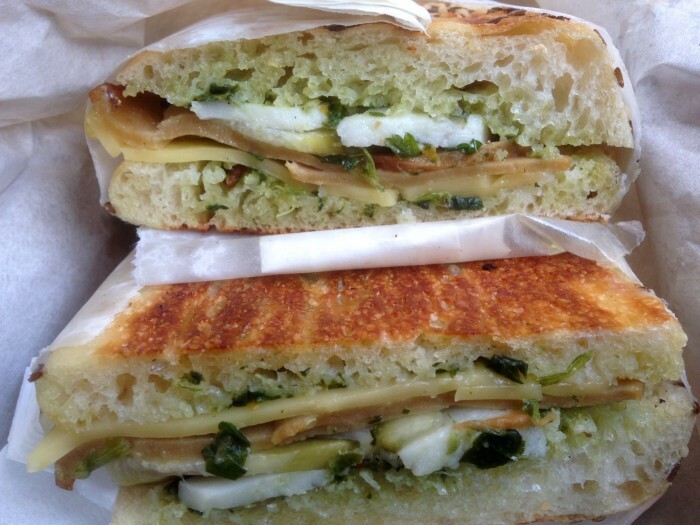 Great food always finds a balance between contrasting textures and flavours, and this sandwich nails it. The sandwich is described as a traditional pressed cuban: ham, roast turkey (both are seitan based), mozzarella, pickles, cheddar and mojo dressing. I almost overlooked it. I certainly didn’t expect to LOVE it. I was eating it for the Vegan Mofo project. But Mo promised me I’d like this sandwich as she handed it to me, and she was right. Swoon! I can never go back to plain old ham and cheese now. A worthy rival for the Home Alone. so glad to hear this review as this is on my list (but further down). Might have to bump it up! I wish I lived in Melbourne. I was really blown away by this one. It is one of the few I have eaten a second time when I was meant to be eating something else for research! Oooh. Will definitely have to have this next time! Yum! They are not open on Sundays. Tuesday to Saturday…so you might need to wait for your Cubano.